More like 4.5 stars. Really enjoyed this book, just not quite as much as the first one! Loving the series overall so far, and can't wait for book 3 this fall! I'm so happy that I decided to reread this! I forgot how crazy that ending was. :o I THINK I'M READY FOR LIBRARY OF SOULS NOW... I THINK. MAYBE NOT, BUT IT'S COMING WHETHER I'M READY OR NOT. HOLY CRAP. I CAN'T EVEN. I'll write my thoughts when I'm able to GATHER my thoughts, but know that I LOVED THIS BOOK SO MUCH. what is it with you people and rating books that aren´t even PUBLISHED??!!! COME ON!! SpoilersDisappointing. The plot was uninteresting, the characters were unremarkable, and the romance was lame.-Summary: Miss Peregine's school and the time loop she created destroyed by hollows/wights/the bad guys, the peculiars/students on the run, Miss Peregine poisoned and not able to fix the loop and protect her kids, Jacob and the other peculiars have to avoid the bad guys and find another headteacher to help Miss Peregine get back to normal.-The majority of Hollow City was dull, there was too much repetitiveness and everything seemed contrived. All Jacob, Emma, and the other Peculiars did was run from one place to another… They occasionally happened to bump into other peculiars who helped them, and every few chapters the wights/hollows caught up to them and they had to fight them. It was the same boring thing over and over again.-Jacob was a lot more likeable in this one, he was so whiny and spoilt in the first book. Even though he wasn't as insufferable he was still a blah character.-It was dumb how the peculiars hardly ever used their powers to fight the wights/hollows, they only used them at the very last minute.-I enjoyed the peculiar tales with the giant and the pigeon, they were better than the actual story.-I didn't buy Jacob and co constantly running into other peculiars. Weren't peculiars meant to be rare? It seemed like everyone the gang came across was either a bad guy or one of them. If the peculiars were a dying breed then I doubt they'd be so many of them running around.-Most of the characters were flat, they only seemed to have a one or two defining facets to their personality. Emma was brave and assertive, Bronwyn was motherly, Jacob was the reluctant hero, Enoch was irritable and mean, and Horace dressed like a gentleman and acted like a coward. There was very little depth and complexity to the MC's.-Jacob and Emma's romance was lame, everything between them was superficial and unconvincing.-I rolled my eyes at Jacob and co getting all pissed and outraged when they found an adult peculiar to take charge and were then dismissed and told they no longer needed to do anything. They didn't like being told the adults would take over and that since they were children they could do nothing. They wanted to help and acted all annoyed at not being able to. But a couple of pages later when they were asked to join the peculiar army and fight hollows, they were all 'Oh noes! We don't want to do anything, it's not out job to save everyone!' - WTF?! Their fickleness and contrary nature was annoying and made no sense.-The twist at the end was pretty good, I wasn't expecting Caul to turn out to be the bird they thought was Miss Peregine.-The pictures and how they were incorporated in the story was the best part of the book, they were the only element that made Hollow City stand out from every other generic YA series.All in all, I wasn't overly impressed, there were only a couple of things that were done well. I definitely enjoyed this book more than the first installment when I read it a two years ago. There were definitely slower moments that were rough to get through, but ultimately, I really enjoyed how the plot progressed in this novel and cannot wait to see how it ends! 3.5 stars.Unfortunately, Hollow City is a case of Second Book Syndrome.Extremely slow start, with many scenarios that I found just too far fetched. (view spoiler)[ Really? Really? EVERY single group they came upon had at least one peculiar person with them?! I call Bull on that!! (hide spoiler)] There has to be a suspension of belief when reading any work of fiction, especially fantasy. But it was too far a stretch for me to believe that the events could happen so easily. Not that the characters had an easy journey, but just too much felt contrived, as if Riggs had really struggled to weave his story around certain photographs. I kept getting a vibe that was reminiscent of A Series of Unfortunate Events. (view spoiler)[Talking animals, a caravan of gypsys, a carnival, are we serious? It was all SO cartoonish, a far cry from the creepy undertone of Cairnholm. (hide spoiler)] That isn't necessarily a bad series to be compared to, although that vibe felt considerably more childish than what I had come to expect from the previous Miss Peregrine novel.While I loved the photos in the first book, I felt like they hindered the telling of this one, it wasn't as flawless this time. I would prefer fewer photos, or even none at all if it meant a better quality story. (view spoiler)[There was too much meaningless filler. Example one, you have the gypsy boy who is turning invisible. The narrative stops and focuses on a scene where he pleads to go with our group, only to be turned away. Was this scene necessary? There was no truly great wisdom imparted, no new information learned. We actually never hear from him again or hear what happens to him. We could have done without this. USELESS! We could have done without the entire animal loop in fact, but this was written in I'm sure to go along with some photos that needed to be worked in. And there was a whole chapter where our group questions people at a sideshow act and we are led to believe they aren't peculiar, only to find out later that they really were. Just... gah, get to the point. Why was all that run around necessary? All because one photo showed a guy in a clown suit and so we had to have a carnival setting to introduce him?? I don't even know what the clown's freakin power is! Was this ever said? Throw that photo away and get on with the garsh darn PLOT! (hide spoiler)] This isn't to say that the story isn't quality, because it is. I am a fan of this series and this author. But I think maybe he tried too much with this book. Hard to explain. It just wasn't an enjoyable read for me personally 75% of the time. I found myself wishing it would either pick up or end already.However, I will say that the end threw me a twist and built up the action. It left off at a good place and makes me want the next book right away. This end section (I'm not sure how much of the book this includes, less than the last quarter) was probably worth 4 or 5 stars to me. But as exciting as it was, I still couldn't overlook the slow beginning. I think I liked this one a little better than the first.. SO excited for book three! Did not finish at 67%People who know me, know so well that I'd rather cry out of boredom while reading a book than actually give up on it. My DNF shelf has only two books and this is the third.I know it's unfair to rate an unfinished book, but it's also unfair that this book is that bad.I don't regret this decision, not one bit! This is the first book in my reading history to have me struggling with even opening the cover, I've struggled since page one and then I thought that no I wouldn't be the kind of a reader who gives up on books just because they couldn't get into them, we all know that books sometimes get to be boring but then pick its pace while you read on. This right here wasn't just boring, it was childish, trivial and very very VERY overhyped that I'm starting to doubt my mentality -maybe I'm not just aspie- maybe I'm just incapable of coping with the hype?Maybe it's me and not the book?Maybe I should've read between the lines?Maybe I should start liking dogs who smoke pipes and wore green glasses?Or maybe I should start befriending humans who growl and park?Maybe I should like books with no plot? Or even ridiculous ones?Or Maybe I should invest my time trying to like books with creepy pictures that are just being shoved into my face?Maybe it's okay to think that a character can be that shallow and underdeveloped?Maybe I should secretly fangirl over a granny who loves her ex's grandson?Maybe I should waste my time reading something that is just absolutely nonexistent?Real reasons why I hated this book- I don't know why but I felt like the whole idea of Hollow City was only written because Ransom Riggs found some photos of animals who are guess what?peculiar and thought yes, there's also peculiar animals which was okay we haven't heard of that before but yeah whatever.-The characters, I don't know when was Ransom Riggs planning to actually put some effort on those kids? Like shading them or whatever? They still feel so shallow and not there, at some point I almost forgot who Bronwyn and Horace were. It's like he flatlayed them over a stereotypical category of bad character-driven books;The bad boy: EnochThe mysterious boy: HoraceThe funny boy: MillardThe stupid, good for nothing boy: Jacob (also runs by the name Bella Swan)The mother hen girl: BronwynThe naive girl: OliveThe angry girl: Emma (also runs by the name Exclamation-Mark-Queen)The one who isn't that important but he was essential because the photo said so: Hugh-The plot, or was there any?-This time the photos really felt forced and uncomfortable, I felt embarrassed for the author, how strange that was, the plot was being shoved at me by photos that actually were messy, unnecessary and awful!-How many peculiars are there on Earth? weren't they supposed to be, like hidden? They met one seriously every step they took.-The romance, or was there any?I wanted to love this series because it seemed like an amazing one, it was so hyped and I was so excited but then BAM disappointment overwhelmed me. I apologize for my cash but I'm not continuing this series. At least not any time soon. That ending has killed me... Well and truly killed me...But anyway, this book is utterly brilliant!! I absolutely adored Miss Peregrine's home for peculiar children and had pretty high hopes for this book. All I can say is that this book was better than I could've ever hoped and may well be the best sequel I have read in my life! !The characters in this book are all so incredibly unique and precious! They're written so well and the dialogue/relationships they have with one another all feel so real. Every single one of these peculiar children has a special place in my heart, and always will.This plot was amazing, there really wasn't a dull moment! The pacing of the book worked really well and everything within the plot was so intricately planned out that the story all fit together perfectly and made an excellent, gripping and entertaining read!I honestly could not put this book down and I'm incredibly excited/scared for the next book! It comes out in September so not long to wait now but I really don't know how I will survive waiting!!!! *4.5 HOLLOW STARS*"Strange, I thought, how you can be living your dreams and your nightmares at the very same time.”I only picked this one up because I recently ended up watching the movie adaption of Miss Peregrine's Home For Peculiar Children and that kind of got me back in the mood to continue this series.But I gotta say, I enjoyed this one so much more than the first book! I'm really glad I decided to continue this trilogy, I can only imagine how crazy the last book is going to get!It's not that I necessarily disliked the first one, I actually ended up rating it 4 stars apparently, but I just expected something more I guess... And this one did the trick! The story was overall a lot better and more captivating, whereas the first one kind of dragged on and wasn't as interesting to read. I also noticed a lot of improvement in Ransom Riggs' writing style and way of telling things. (Or that could also be just me being way more into this book than the previous one lol)Our group of peculiars also had a bigger role in this book and got a lot more depth, whereas I felt like in the first book, most of those characters were being kept pretty shallow and they concentrated more on Jacob, who's one of my least favorite characters to be completely honest.Full review coming soon! That ending: WHAT THE HELL JUST HAPPENED? I love this series. The peculiar children in these novels are so fascinating. This story had me hooked just like the first book did. There were parts I wasn't crazy about but it was still good and the pictures were good, too. Looking forward to the next in the series!! I thoroughly enjoyed this! I did prefer the first book, because the mystery elements really are what captivated me so much, and I found this second book to be a lot more formulaic. I found the first quarter of the book a bit hard to get into which is why this is one star less than I rated the first one. But otherwise, I did really enjoy it!His writing style continues to be beautiful, and I adore the aesthetic. I am really happy that he went there with things like freak shows because that fits the vibe so well. I found the scenes of war to be harrowing and devastating and I think the historical aspects are fantastic.The photographs work well and I think they felt less manipulated into the story this time; it felt more like he came up with ideas and found pictures to match rather than forcing in plot lines to fit with cool pictures.The development of plot was simply a little less mysterious and more predictable, the majority of the story being the journeying type which is fairly common for middle of trilogies. It did feel like a second book, a bridge to something bigger, but it had plenty interesting scenes along the way and it was quite successful for what it is. The Hollow City is the second installment in Rigg's trilogy of the Peculiar Children's exciting adventure, and it is a worthy following of its predecessor. But did I enjoy it as much as the first volume? The answer is a hesitant ''no''.Hesitant bceause I cannot, clearly, state what it was that made me feel that something was missing. Up until the 45% mark, it was a real page - turner, then, gradually, I seemed to lose interest. Perhaps, I couldn't fully connect with it as I was reading the first two volumes of ''The Grisha'' trilogy and the Ravka universe had completely sucked me into its lore. But probably the actual reason was simply that it became repetitive and predictable. ''Predictable? Really? '', some may think, ''why, with so many twists and turns?'' Yes, there are many twists and turns and chasings and cliffhangers. More than I can count, but the narrative reached a point where I, as a reader, knew what to expect. (view spoiler)[Every stranger was a threat that was eliminated by the intervention of another stranger and so on and so forth...This continues until the very end to the point where the conclusion of the second book left me a bit indifferent. The introduction of the Peculiar animals further alienated me from the story. It was just too much for my liking. Also, the absence of Miss Peregrine didn't help. (hide spoiler)]The writing and the dialogue are polished and engaging, though I could do with less of Enoch's constant bickering and battling words with everyone, and I would like to see more than just a passing glance as to how (view spoiler)[Jacob's parents are dealing with his absence. (hide spoiler)] What makes the book rich is the new set of peculiar photographs that manage to be even creepier than the ones found in the first book. I simply loved them all!Can you tell I am confused? Because I admit I am. The Hollow City is a good continuation of the story and perhaps this is just me nit-picking, but I expected to feel the well-known enthusiasm of following the Peculiars' adventures and it didn't happen. Finger crossed that the third part of the trilogy will restore my admiration for it. Do you ever find yourself climbing into an open grave during a bombing raid..and wish you'd just stayed in bed?If only you knew how often I've run into that exact situation...The peculiar children are in the midst of escape. Their ymbryne is irreparably injured, the wights are right behind him and hollowgasts are ahead. And as with so many YA books, they have to save the world (at least there isn't a love triangle).The peculiars stumble upon a time loop leading to somewhere extremely peculiar. (Note: Nice tie-in to the Tales of the Peculiar - good, subtle plug). Adding in creature-peculiars threw me off (it could have been the awful voice given to the emu-raffe in the audiobook) or the sheer craziness of adding in a whole new dimension (via animals) to an already extremely stretched book. As before, this one is littered with vintage photos depicting the characters. This is a bit of a conundrum because while I love a book with pictures, it sometimes felt like Riggs stretched the story to include all of the images he wanted. Riggs: Oh Em Gee. Is that a dog with a pipe? No freaking way, this is totally going in the book.Once again, I love and appreciate that Jacob is a bit of a wimp while Emma is this feisty strong gal. I've hardly read any books with the male lead being consistently shown up by the girl he likes (without adding in jealousy or mean-spirited envy).Fun book - looking forward to the third! I won Hollow City as part of Goodreads First Reads giveaway. Can we say BEST CHRISTMAS PRESENT EVARR? The waiting thing is destroying me though and I may just sit at the mailbox until I get it.REVIEW: Jacob and the Peculiar Children we've grown to know and love are back. Their adventure opens immediately after the close of the first novel, and as they set out to save Miss Peregrine, new danger and excitement awaits them. Jacob struggles with his newfound abilities, and the pressure of leaving his family behind, and his romance with Emma.Hollow City did not disappoint. In fact, I liked it MORE than the first book in the series. We get to know a lot more about the Peculiardom as well as the individual characters (-SPOILER -however fans of Claire and my personal favorite Fiona may be disappointed as they are missing from the majority of the novel). Ransom Riggs is a master of detail and atmosphere - every sentence is perfectly crafted to bring the book to life, with a perfect blend of action, humor, horror, and even romance so that every reader truly has something to gain from opening this book. I DEVOURED the book faster than a starving hollow would devour a child (ha! ), even when I was forced to put it down (damn you, college!) my heart longed to be back in the story.Dear Mr. Riggs: Please make the Tales of the Peculiar into a book, like Rowling did with The Tales of Beedle the Bard!I absolutely cannot wait for the third installment, and hopefully Ransom Riggs will get a movie deal out of these books because the would play out brilliantly on-screen.Why are you still reading this? Go - buy book now, do the reading thing! Çeviri bitti!inanılmazdı! Birinci kitap bitince nasıl "Çabuk bana ikinci kitabı verin!" diye bağırdıysam ikinci kitabın sonunda da aynı şeyi hissettim. "Yok artık, o kadar da olamaz," diyerek okuduğum çok fazla yer oldu. Bir kere daha çeviriyi bırakıp kitabı okumamak için kendimi zor tuttum. Şahsen, ikinci kitabı birincisinden daha çok beğendiğimi de itiraf etmeliyim. 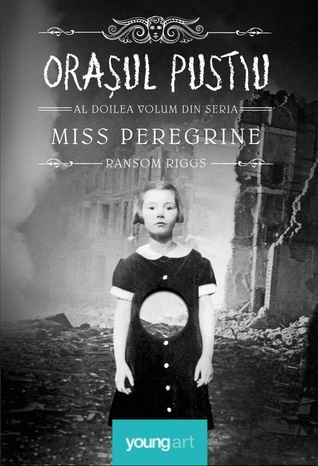 Eğer Bayan Peregrine'in Tuhaf Çocuklarını sevdiyseniz Hollow City'yi daha çok seveceksiniz.Kitabı kestiği yerden ötürü Ransom Riggs'i pataklamak isteyenler için de bir grup kuracağım:) Library of Souls'u boş boş beklemeyelim, değil mi?Tatlı okumalar! What a disappointment..I had so many expectations about this one but it only let me down.. I had loved the first book in the series, Miss Peregrine's Home for Peculiar Children & I wanted so much to love this one too but unfortunately the only good thing about this book was the photos, which like in the first book, they blew me away by how real and authentic they look.This one lacked the magic the first book had, it was kind of idiotic and the author tried to take an even darker turn to the events but failed dramatically in doing so. The first book was dark and funny at times but still managed to retain a bit of its drama, something that this book didn't even get close enough to. This was morbid for sure, and while most of you may call this realism, I'll call it "failure at making a sequel". I'd rather it if this had never come out and the story would have just ended in the first book. At least, the first one left me with a sense of awe at its ending. The characters didn't have the least bit of development, which was a HUGE MISTAKE. These characters, who are so amazingly written, they deserved something better other than the same thing over and over again. The romance between Jacob and Emma failed to captivate me like I thought it would and while I thought they were cute in the first book, I don't like them together at all in this one.The plot was very poor, I mean the entire book was running around trying to get to someone and it all ended within 10 pages.It doesn't even deserve its 2 stars but let's just go with it because the photos are still part of the book, and I loved them dearly. Hollow City is one of those sequel novels that irons out many of the kinks in the first novel. It further goes to prove that the quality of children's and young adult' fiction is improving all the more in this day and age. Where once such books were throw away pieces to pass the time till younger readers could engage with more serious pieces of literature, today they are or should be recognised as being equally serious and nuanced - with the same level of power as books regarded as more mature.In Hollow City the themes of the previous novel are explored further and with. One of the things I've appreciated with the two books in this series so far is the play upon the mixture of vintage history (through the photographs or factual evidence) and modernity. For instance the whole idea of vile wights existing and infiltrating all sorts of historical areas (such as Nazi Germany) and using them to hunt down gypsies and peculiars is one such example.I suppose the greater theme to be found in these novels though is the theme about identity and belonging. Several of the peculiars try to dismiss others because their 'peculiarities' or powers do not make them as peculiar or unusual as themselves. It has always interested me that even those who are on the fringes of , or 'othered' by, society can still find time to dismiss and others those within their particular 'caste'. It seems that humanity is destined to a history and future of classification, stratification and separation where possible so that we can consider some among us to be more desirably human than others. Which is something sad considering that true human worth and beauty is not about appearances but about character, heart and existing as an individual. On the whole I loved both the first two books. I, do however, still find some aspects to them at times slightly rough or jarring and so cannot consider them perfect books. Yet in terms of the story, the writing and the whole conception, these are novels which are nicely polished and as such I think should be read ahead of many other young adult novels. DNF around 20%. I just can't get into this. I'm not attached to the characters or the story at all, and I have too many other books I'd like to read more than this. This novel features a picture of a bulldog smoking a pipe. It was my everything.If you have forgotten the events of the first entry in this series or read it a long time ago, I'd highly suggest a quick re-read or a glance at the wikipedia synopsis to familiarise yourself with the events from the first book. The reason for this is that the second novel in the 'Miss Peregrine' series picks up directly at the end of the first one, with our bunch of peculiar children heading to the mainland in their rowboat to escape the bombing of their once precious loop, all the while still trying to avoid those dastardly wights. This novel is best compared to a game of hide and seek, with our children being the hiders and the hollowgast being the seekers. It is a novel 'on the run' which while at all times enjoyable, can also feel a little directionless at times. As we follow our gang from one place to another, extra peculiars are added while others are left behind, bringing with it a more epic adventure feel, than the loop confined story of the first. Things I liked:The Setting - The journey through a war torn London was very well done, and I liked the irony of our kids making their way there on the train while so many other children were being evacuated out of the city. I think the decision to continue the story in 1940's to be a perfect one, allowing for eerie settings, eerie descriptions, and of course, eerie pictures. New Characters - The introduction of a few more peculiars were welcomed, whether they be in the book only for a short time, or seemingly joining the group for the rest of their adventure. It's always interesting to see what wacky superpowers can be concoted from a single photograph, and the new powers are well imagined. The main character of Jacob also seemed like a new character, simply because as his powers grow, he tends to be more confident, and less whiny (I guess) than in the first book. The Wights - I won't go into the details on this, but I appreciated that the wights had evolved a bit more to make them a more formidable presence in this entry. Things I didn't like:The Side Paths - Just like the first novel, some of the pictures used in this entry didn't seem AS connected to the main story (unless they play a part in the next novel) as some of the others. For instance, a trip to the animal menagerie (a loop full of animal peculiars) didn't really seem to have much connection to the plot, other than to show a couple of odd animal photos. Although I'll totally forgive it for the bulldog picture, I mean, come on. This is a meme that will never get old to me. Overall, if you enjoyed the first entry in this series I see no reason you won't enjoy this one also. I do think however, that if you didn't enjoy it, this doesn't bring enough new things to the table for you to change your mind. Overall though, I enjoyed it, so 4 stars! I absolutely freaking adored this book! I didn't think it possible to get better than the first book but it most definitely did. The story is even more gripping and as I got to know more about the world of peculiars, I couldn't help but fall even more in love. This book is jam packed with action and is absolutely nerve wracking from start to finish. I loved getting to know my favourite characters more as well as being introduced to new ones which I can't wait to learn more about in the next book. I also really enjoyed the bits of the Tales of the Peculiar. They added an extra element to the story that I loved. And once again the photos were stellar and really made me feel like I was living the story along with the characters. I could go on and on about how much I loved this book but I'll stop now so I can get started immediately on the third book because that ending left me needing to know what happens next! Ransom Riggs Gabriella Eftimie - Hi, I'm Ransom, and I like to tell stories. Sometimes I tell them with words, sometimes with pictures, often with both. I grew up on a farm on the Eastern shore of Maryland and also in a little house by the beach in Englewood, Florida where I got very tan and swam every day until I became half fish. I started writing stories when I was young, on an old typewriter that jammed and longhand on legal pads. When I was a little older I got a camera for Christmas and became obsessed with photography, and when I was a little older still my friends and I came into possession of a half-broken video camera and began to make our own movies, starring ourselves, using our bedrooms and backyards for sets. I have loved writing stories and taking photographs and making movies ever since, and have endeavored to do all three.